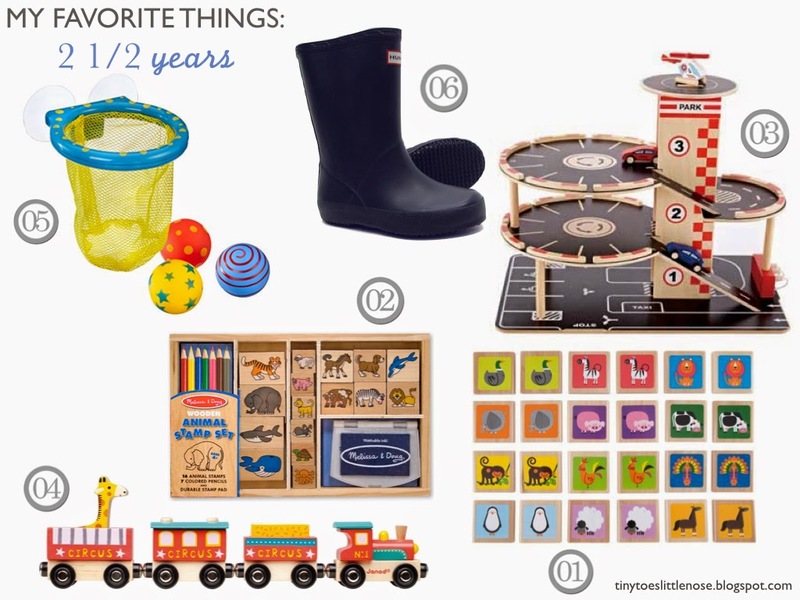 I haven't done a "favorite things" post since Liam was 2, so here is an updated version of the things that he is particularly pumped about these days! Puzzles & books still reign supreme in our house, but I left them off for fear of boring you all with same ol'. And with Valentine's Day & Easter just around the corner, this will serve as the perfect gift guide for all those little ones in toddler land! 1. Hape Memory Game : This is the first game that we have really sat down & played as a family. Such fun evenings with this little set. I like that's wooden (don't I always), and that it is a smaller than a typical set. Not to mention the pictures are beautiful! The perfect beginning to the wonderful world that is memory! 2. Melissa & Doug Stamp Set : Stamps are messy, but oh boy do these keep Liam occupied! 3. Hape Park and Go Garage : Santa brought this, and Liam is obsessed! Overhearing his pretend play is one of the best parts of my day. It has ramps, an elevator, a gas station, & a helicopter pad. It's amazing, and high quality ('cause dare I say it...wooden)! 4. Janod Circus Train : This is the new hot train on the track! We use this on Liam's IKEA set, which it fits on perfectly. The giraffe is a bit on the tall side, so no tunnels on the track when he's in use but we make do! This is by far my favorite toy brand, so really you should check out all their goodies! 5. ALEX Bath Hoops : We bathe Liam every night, so bath toys need to be constantly mixed up! This is our newest addition and it has made our nightly routine a bit wetter & louder, but far more fun! Plus, I like to think it's helping with his game... We will have perfected the alley oop in no time! We will be ordering the matching game right away! Just have to decide whether to give it to him for Valentine's Day or Easter. I've been looking at matching games for O for weeks now! That one is so cute! It is so fun when they start being able to play games! We got O this Roll & Play game by ThinkFun and we play it together all the time! Those mini Hunter boots!? So cute!! Love that parking garage! That's going on Wyatt's birthday list! My husband, I mean Lily!!! ;), would enjoy that bath time hoops! Such fun suggestions!! I love that you guys play the game together! I'd love to instill family game night at least once a week. I invasion pizza for dinner and board games after :) So fun!